These are the contexts of the quotations tweeted from @sueannbowling between January 30 and February 5, 2014. All but the last are from Killashandra, by Anne McCaffrey. “This assignment could be interesting.” Killashandra’s thoughts after she looks up the planet Optheria. “Fidelity was an unlikely disease for her to catch.” Killashandra has always been rather free with her favors, and wonders if her association with Lanzecki has changed her. “That any form of artistry might be limited by law was anathema.” At least to the Federated Artists Association! 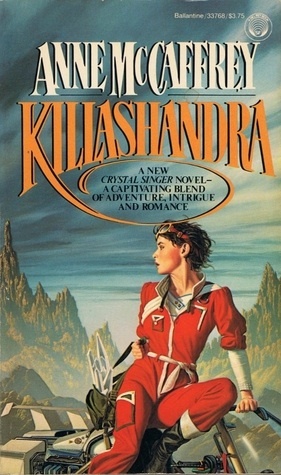 “A genuine one-solution tragedy, where hero and heroine both lose out.” Killashandra is comparing her own romance with Lanzecki to an operatic plot. “One can get too wrapped up in role-playing.” Killashandra has, out of boredom, pretended to be a student on the journey to Optheria. Now she is wondering why she is keeping up the pretense with another traveler. “Something was to be said for the curtailment of natural ‘beauty’.” Killashandra feels that allowing rather ugly thorn bushes to take over pedestrian walkways is going a bit too far. “There were some things he didn’t know or was just careless about, and I was able to use those.” Tourist Trap, by Sue Ann Bowling. Roi’s explanation to his father about how he managed to call for help, even though Zhaim was much the stronger of the two. Here are the contexts of the quotations tweeted from @sueannbowling between December 26 and January 1. All but the last are from Crystal Singer, by Anne McCaffrey. “You want what you can’t or shouldn’t have or are denied. Human nature.” Killashandra, considering how she accepted the irrevocable contract with the Heptite Guild. “One still had to know what question to ask.” No matter how good the data-retrieval system, you still have to ask the right question. Killashandra is thinking that computers haven’t changed all that much since their invention. “The best computer is still the human brain.” Rimbol, after Shillawn admits that he found out an elusive piece of information by asking a person, not the computer. “No one ever does a favor without expecting a return.” Killashandra’s rather cynical view of life, based on her experience in music school. “Gratitude depends on memory.” Lanzecki’s advice to Killashandra, pointing out that it’s hard to be grateful for something you can’t remember. “I am going in this direction, and nothing is stopping me.” Killashandra’s interpretation of the look of a military cruiser. “You don’t have to be a young aristocrat if you don’t want to, but you can act like one.” Sue Ann Bowling, Homecoming. Lai’s advice to Roi on his presentation at his sixteenth birthday. Here are the contexts of the quotes tweeted from @sueannbowling between November 21 and November 27, 2013. All but the last are from The Crystal Singer, by Anne McCaffrey. “It is the manner of dying that can be the worst.” Borella’s response to Caragana. “The final portion of any journey always seems the longest.” Killashandra’s thought as the shuttle is maneuvering to land on Ballybran. “A restriction is only restricting because you know it exists.” Killashandra, when someone brigs up the fact that they may never leave Ballybran. “Every profession has terms that sound familiar and are dangerous to the incompletely initiated.” Killashandra is wondering just what the exact meaning of “brought in” is on Ballybran. “She’s got more faith in me than I do.” Homecoming by Sue Ann Bowling. Lai is speaking, after the captain of the Bounceabout is perfectly willing to follow his lead lifting off Mirror in the storm. Here are the contexts of the quotes tweeted from @sueannbowling from October 17 through October 23 2013. 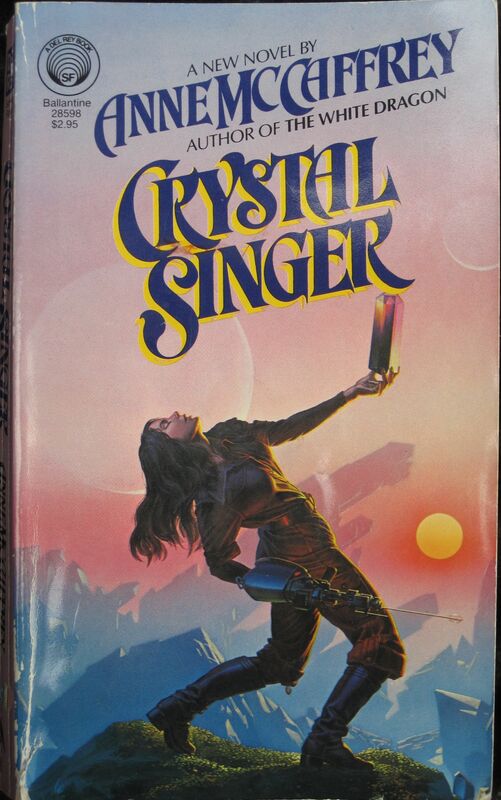 All but the last are from Crystal Singer, by Anne McCaffrey. “I won’t be second-rank.” An expression of the drive that ultimately caused Killashandra to become a crystal singer, but here it is being expressed in resentment that her dream of becoming a top-ranked opera singer can never be realized. “She’d be at the top in whatever she did or die in the attempt.” Killashandra’s vow to herself. “Danger was relative.” Killashandra’s first response to the dangers of Ballybran and the crystal singing profession. “It depends on what you’re willing to consider a hazard.” Killashandra soothing Carrik, when the Ballybran symbiont makes it necessary that he return to Ballybran. “A two-cell in a one-cell pond?” Carrik’s response to Killishandra’s statement that she prefers the odds of succeeding in a small guild. “A dead hero in preference to a live coward?” Carrik continues to bait Killashandra. “Beauty that enhanced his value was worth the effort.” Homecoming, by Sue Ann Bowling. Roi is still thinking like a slave, concerned with keeping his market value high enough to give him some measure of protection. Here are the contexts of the quotes tweeted from @sueannbowling from September 12 through September 18, 2013. All but the last are from The Skies of Pern, by Anne McCaffrey. “We came because that was what we’d done, had to do, did. M’Rand, quoting the old Question Song as he prepares to step down. “It was the set of their minds: their self-appointed mission to deny choice to others.” Tagetarl’s thoughts on how the Abominators differed from others. “Not everything and anything new meant an improvement.” Tagetarl remembering something Menolly had said—but he goes on to say that people must make their own choices as to what to accept. “It never occurred to him that he had only himself to blame.” Toric, stuck in a meeting about the new observatories. I’ve often wondered what Anne McCaffrey intended to do about Toric, who by this point is rather obviously going to have to be dealt with. “Such people are afraid of what they don’t understand, won’t understand.” F’lar talking to Lessa about the problem of the Abominators. “Practice, I believe, always improves performance.” Lytol, after F’lessan says that he hopes to be able to make a more graceful landing in the future. “I believe” shades into “I know.” Homecoming, Sue Ann Bowling. Lai, explaining why he is not against religion (and has his own) but is doubtful of dogma. P.S. 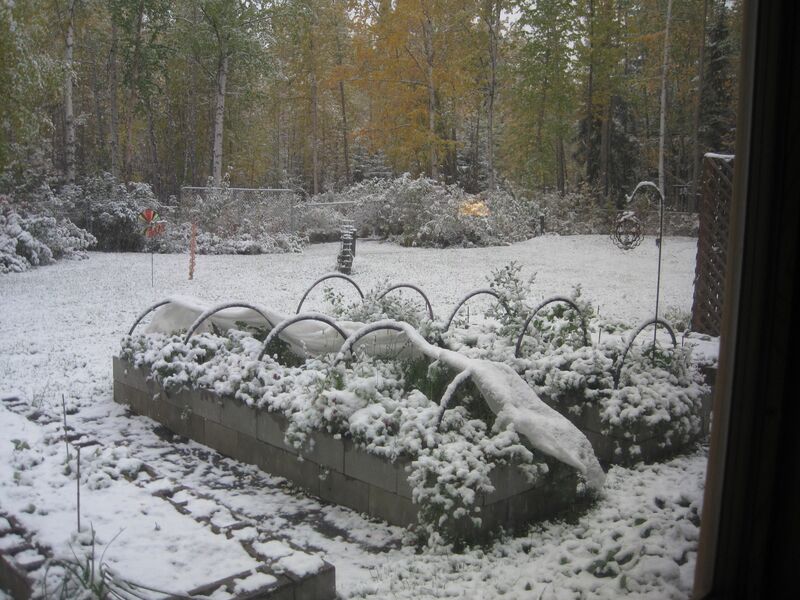 I think summer’s over, regardless of the calendar. 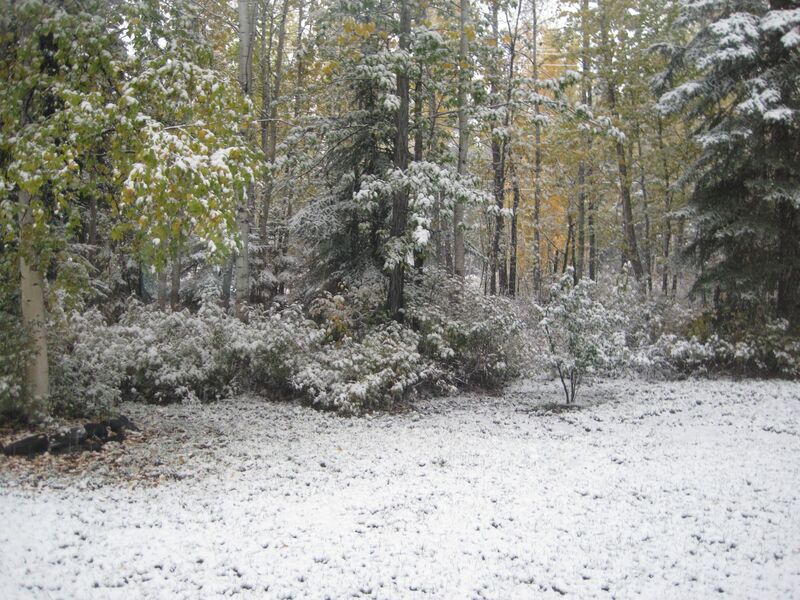 This is what I woke up to this morning. I’d better get the plastic off the herbs today. But I’ll need help to get the moose barrier up around the maple. The first six quotes are from The Skies of Pern, by Anne McCaffrey. “We cannot change minds and attitudes overnight.” Lord Groghe, after the first attack on the Healers and Glassmakers. “The benefits of technology are often ambivalent.” F’lar, discussing the attacks and possible reasons. “We know the problem; it’s the solution that eludes us.” Seball’s reply to Groghe’s statement that the younger generation doesn’t want to work for anything. “Some will never understand.” Jaxsom, commenting on the fact that few seem to understand what the dragonriders did to eliminate thread as a future problem. “Those are happy to believe easy lies rather than complicated truths.” Jaxson again, commenting on the tendency of those with poor education to be easily misled. “Boats are replaceable. Lives are not.” T’gelllen to the dragonriders sent out to rescue people of a fishing village from a tidal wave. “You don’t go asking guests for favors.” Bowling, Horse Power. Timi to his children when they hope to get Roi to Heal a broken-winged bird. These are the contexts of the quotes tweeted between May 9 and May 15. 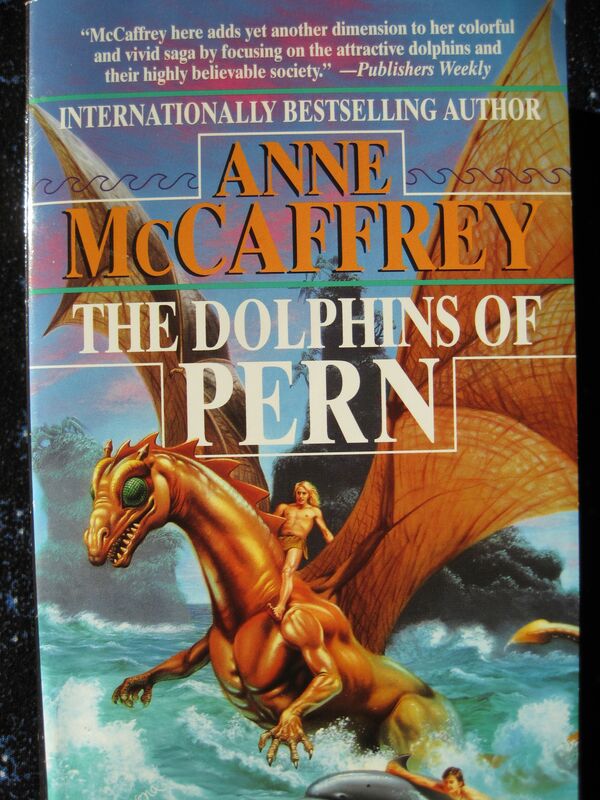 “I know it is not the truth, and I say so.” The Dolphins of Pern, by Anne McCaffrey. Master Fandarel is contradicting rumors he knows are not true, that the dragonleaders are dragging their heels about settling the Southern Continent. “We intend to talk to you or at you or at you, but you would be wise to pay attention.” The Dolphins of Pern, by Anne McCaffrey. Larad, speaking for the Lords when they confront Toric. “I sing the songs of old so that the young do not forget the past.” The Dolphins of Pern, by Anne McCaffrey. The Tillek (Head of the dolphins) in response to Seball (Masterharper) saying she has much the same position as he has. “When your Master calls, you go.” The Dolphins of Pern, by Anne McCaffrey. Readis’s new master and teacher is the Tillek, and she has just called him to join her. “Stars did not change their courses.” The Skies of Pern, by Anne McCaffrey. Shankolin, one of the conspirators against AIVAS, rehearsing to himself what his father taught him. “He had a duty to perform, a wrong to right, and a theory he must confirm or forget. The Skies of Pern, by Anne McCaffrey Shankolin again, justifying the terrorism he is planning. “Maybe I can do something about it when I’m older, but not alone. Tourist Trap, Sue Ann Bowling. Roi dislikes more than one thing about the Confederation, but he knows no one will listen to someone as young as he is. Here are the contexts of the quotes tweeted at @sueannbowling from April 11 through April 17, 2013. All but the last are from The Dolphins of Pern, by Anne McCaffrey. “The mind can only absorb so much.” Menolly, fretting at the sheer amount of new knowledge coming from Aivas. “Nighttime confessions and doubts generally are regretted in daylight.” Menolly is trying to laugh off her own worry. “I’m always after my patients to exercise and get fresh air and I never listen to my own advice.” The Healer, Oldive, after the first day with the dolphins. “Games can be as necessary as work.” Robinton, talking to Lessa who he thinks has been driving herself too hard. “How can you think of something like school when the whole world mourns?” Master Robinton has just died, and Readis is being lectured by Kami. “I don’t invite myself to meals empty-handed.” Sue Ann Bowling, Horse Power. Roi is talking to Amber in the food market, just after he has added some off-world delicacies to her food order, which he intends to pay for. These are the contexts of the quotes tweeted from @sueannbowling from March 14 though March 20, 2013. 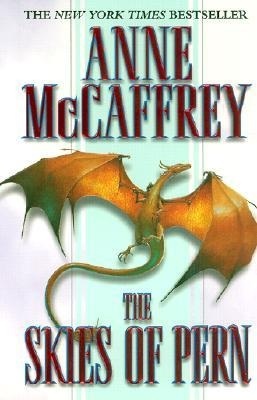 “Can you do more than act with honor?” Anne McCaffrey, All the Weyrs of Pern. Ruth, the white dragon, speaking to Jaxsom after he has made the decision to exile Master Robinton’s kidnappers. 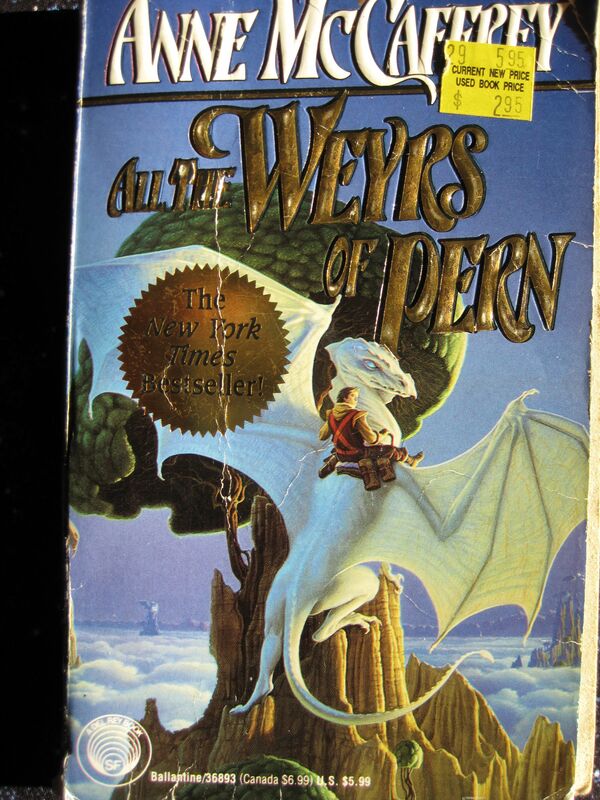 “Everything takes longer and costs more.” Anne McCaffrey, All the Weyrs of Pern. Hamian, who has to try to manufacture the space suits. “Some basic skills did not change.” Anne McCaffrey, The Dolphins of Pern. Some things have been lost on Pern, but others, such as fishing methods, stayed very much the same. “Knowledge is sometimes two-edged.” Anne McCaffrey, The Dolphins of Pern. Menolly is wondering whether all the knowledge they are receiving from Aivas is not potentially a problem. “Something back there is going to eat us.” Bowling, “Horse Power.” The way Roi expresses the feelings of a stampeding herd of Silkies.